So you've made the decision that you want to go to Europe for the summer on a tour or your friends convinced you that it could be fun to take two weeks to go explore abroad. The problem is that you don't have tons of money and tours cost upwards of $2,000, and that doesn't include the flights to get there. What do you do? Before you freak out and give up on your dream, there is a way around this. For proof of how I could spend so little on a Euro trip, watch my video diary of my most recent trip to the other side of the pond. Please share the video with friends who need a guide on how to save money on travel. For the naive traveler, Googling "Euro trips" will show you a variety of sites like Contiki and others that put together an entire trip for you and all you have to do is pick your date and pay the insane amount of money and you're on your way, with every single moment of your journey planned out. Now I realize that some people need that structure and that having someone else plan your trip is helpful for a novice. But at the end of the day, these types of trips charge you thousands of dollars for a short amount of time and there's not really any wiggle room in your route. I'm here to save your life in this regard. You can easily plan out your own trip, save money and go wherever you want for whatever length of time you have. On my most recent trip (as you can see from my video above), I spent less than $1000 over a two week duration, which is something that would be impossible if you pay outright for a tour. By staying in hostels, eating inexpensive food, going on free tours, and walking as much as possible, you don't have to be rich to have the adventure of a lifetime. The first step I'd say would be to go to websites like Contiki, EF College Tours, Busabout, etc., and look at the routes they take to see which one most fits your ideal itinerary. Often times they'll show you where they're going, how long they spend in each place, and even some of the excursions they go on. From here, you can copy them and alter it to fit your whims. These routes can also be helpful if you're not even sure where to go, as they tend to hit the top spots that most people want to see. Once you've figured out where you want to go, it's time to start looking for flights. Here's where you can either decide to splurge or save. I prefer to save. What many people don't realize, is that having days in mind before you book is where you'll actually go wrong when it comes to saving money. You HAVE to be flexible when booking flights to get the best deal. I follow the following sites to watch for cheap flights, error fares and just overall inspiration on where to go. There's a million ways to try and figure this out, but a lot of the time, flying round trip is actually going to cost you more than potentially either buying two one-way flights, especially out of different airports. It's usually cheapest to fly from the US or Canada to London, and then for some reason, cheaper to buy a one-way back from a different European city. Mess around with multi-city flights or just checking the one-way prices. Or sign up for daily emails from the sites to see what deals they've found today. I got a flight from Newark to London and returning from Madrid for only $220, which is probably $800 cheaper than what it would've cost without finding that deal. I had to be flexible with the dates, layovers and airports, but obviously it was very worth it. If you're traveling all over Europe, how are you going to get to each place? Well, Europe is super cool and knows that people like to go on trips, so they have various budget airlines, buses and trains that will get you places in a short time and for not that much. It all depends on your budget and how much luggage you have. If you're traveling light, you can get amazing deals on airlines as long as you aren't carrying a large suitcase. If you have a lot, consider traveling by bus so you don't pay extra for a bag. Inter-country train journeys can get slightly pricey, but if you buy in advance, you can get some good deals. I personally don't think the EuRail Pass is worth it as long as you plan out your train trips. As soon as you've bought your flights, it's time to reserve your accommodation. There's two types of people; people who stay in hostels, and people who don't. If you choose to go the budget route, hostels are kind of your only choice. A few years ago, Airbnb was very cheap, however, the prices have gone up a lot for major cities, so it's unlikely you'll find a room that's much cheaper than a hotel (unless you're going with a large group and can split the price many ways). If you're going alone, or with four or less people, hostels are going to be where you save. The earlier you book, the cheaper the rooms may be, and the more options you'll have to choose from. If you wait until the last moment, there may not be any inexpensive options left. Now that you've saved tons of money on transportation and accommodation, what about food, activities and all the other little things that end up costing money on your trip? Transport to & from airport to city - Some hostels have prearranged pickups that are either free or discounted. Check with yours to see if they have this option. Otherwise, research before you go how to get from the city to the place you're staying. Some airports or even train stations can be further outside of the city than you expected. Bus/Metro/Subway cards - While walking is obviously free, some cities are much to large to get around without taking some sort of transport. If you go into a station, you can usually get a ride pass that's cheaper than buying one ride at a time. Calculate about how many rides you'll need and see if a 1-day, 3-day or 7-day pass is the best option for you. Grocery shopping - Most hostels these days have a fully-equipped kitchen which you can use to cook food. You'll save a lot of money this way. Of course, if you're a foodie or don't mind splurging on food, then go for it, but also McDonald's could be your new best friend if you don't want to spend more than $3 on a meal. The best things in life are free - Any Google search for the location you're going to will give you a list of activities to do while there. Realistically, many of them will actually be free. It doesn't cost anything to walk around a city and just enjoy it and see pretty things. Obviously there's things like going up the Eiffel Tower that you'd be sad to miss out on if you don't want to pay for it, but especially in Europe, many cathedrals and museums are free. Getting out of the city - I firmly believe that in most cases, planning your own excursions will be cheaper than the cookie-cutter ones provided by local tour companies. However, that's from doing obsessive calculating of costs for each time I wanted to take a side trip. All inclusive day trips or treks are probably worth it, especially if it includes the transportation and a tour guide to lead you through it all. If you're going somewhere between an hour or two away, you can probably go on your own and save a lot of money. For example, going from Naples, Italy to the Amalfi Coast is simple by taking a inexpensive train to Sorrento and then hopping on a cheap bus to any of the cities along the route and it cost less than $10. If I had tried to plan my own trip to the Cliffs of Moher from Dublin, it would've been extravagantly expensive, so I found a tour company that did day trips for only €40. I have a few of my own hacks for saving money here and there that I've found useful over the years of traveling and living in Europe. I'll share them because I truly believe that exploring the world shouldn't be some thing that only rich people can do. When you fly into London, it's likely that it'll be either Heathrow or Gatwick airport. Don't take the express trains into the city. They're fast, but much too overpriced. From Heathrow, you can take the Underground for only £6 (less if you already have an Oyster card), or take a National Express bus. From Gatwick, you can take the EasyBus for about £3 or the Southeastern train for £8. While taking the London Underground is lovely and everyone should do it at least once or twice, the forgotten gems of London are the red, double-decker buses. A ride is £1 cheaper than a trip on the Tube and may take a bit longer, but if you go up to the second floor, you get an amazing view of the city. The Number 11 and 15 buses have the most iconic routes where you can see the most sites. When you're younger, an overnight bus from London to Paris won't kill you and you can save a bit on fares. But if you can't sleep on buses and want to be refreshed and in a new country in only 2.5 hours, it's actually worth it to take the Eurostar, even if it costs a bit more. And the further ahead you book, you can get roundtrip tickets for only $88! If you're taking trains between countries in Europe, it's seriously best to book them in advance online or else you might get into a crappy situation where you miss a train (as I did in the past and it definitely sucked). I use Rome2Rio to figure out a route and then use Loco2 to buy the tickets and save time. If you have any other questions, please feel free to drop them in the comments or use the contact form to get in touch. I love to help people get abroad and it gives me such joy to see people take the leap to take a trip that isn't already planned out for them by a company (not that this is a bad thing to do of course). 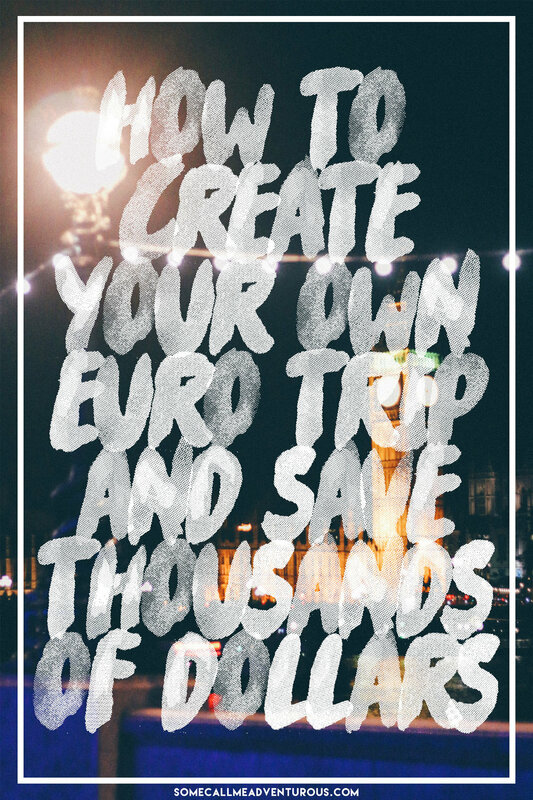 But in the end, you can save a lot of money by being a bit brave and creating your own adventure. I know I wouldn't have been able to travel nearly half as much as I have unless I had put together my own journeys and saved literally thousands of dollars.